In the discussion of replacing coal with natural gas, two numbers are commonly used. One is that natural gas produces only half the CO2 pollution. That can be improved to a 72% cut in CO2 by upgrading to combined cycle gas turbine plants. The other number is that over 100 years, fugitive methane from leaks is 34 times as polluting as CO2 by weight. But weight does not matter, only the number of molecules to produce energy. When that is corrected for, the warming of methane over CO2 is lowered to a factor of 12. 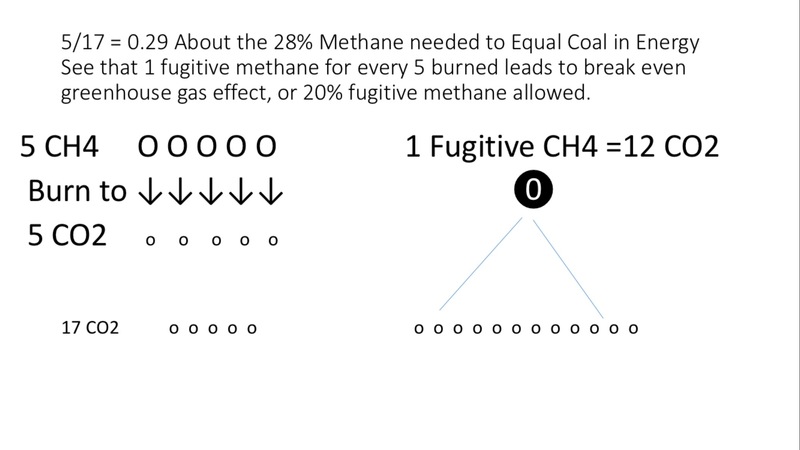 Combining the two factors raises the breakeven point for fugitive methane from 3% to 20%. This means that even if leakage is as much as 5%, greenhouse warming is reduced by 55% by converting from coal to natural gas. These changes are illustrated by figures in this article. We include a figure for how the comparison of methane versus carbon dioxide warming by weight over counts methane molecules by about a factor of three. 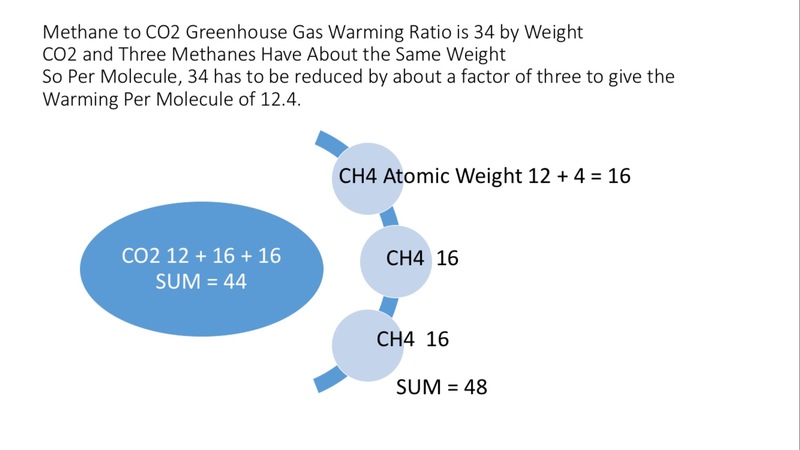 Instead of the warming of methane over carbon dioxide being a factor of 34 by weight, it is reduced to a factor of 12 by molecule, which is important in referring to energy production and fugitive methane leakage. This is also discussed by Richard Muller, UC Berkeley, based on work by Richard Muller and Zeke Hausfather. I also include a figure that illustrates the calculation of what the amount of leakage of methane or the breakeven point would be if old 33% efficient coal plants were replaced by 60% efficient combined cycle gas turbine natural gas plants. The breakeven point would be 20% leakage of fugitive methane compared to methane used for power production. This is compared to the previous breakeven of 3% calculated using the incorrect comparison by weight, and replacing 33% efficient coal plants only by 33% efficient natural gas plants. Comparing the energy produced per molecule from coal or burning carbon, versus methane, since methane CH4 also burns the hydrogen, it turns out it produces twice as much energy per molecule as a carbon atom, but both produce one CO2 polluting molecule. We emissions for methane start out at about 50% for the same energy produced. Then if replace a 33% efficient old coal plant with a 60% efficient gas turbine combined cycle natural gas plant, we need less fuel by 33% / 60% = 0.55. Multiplying this 0.55 by the 0.50 decrease per molecule for methane, gives only 28% as many methane molecules burned for the same energy as carbon, or only 28% the amount of CO2 produced. That is the reduction of CO2 by switching to methane is 72%. Now we look at the effect of a single fugitive methane molecule that has the same greenhouse gas effect over 100 years as 12 CO2 molecules. To include the efficiency effect of producing only 28% of CO2 from methane burning versus coal, it is convenient to start with 17 coal or carbon molecules burning to 17 CO2 molecules. It only takes 5 CH4 molecules to produce the same energy, as shown in the figure, since 5/17 = 0.29 is almost the same as 28%. But if one fugitive methane is released for every 5 burned, that is equivalent to 12 CO2 for warming, and we break even with no advantage in greenhouse effect by switching. Thus one fugitive methane for every five burned, or 20%, is the break-even point. This leaves much more room for leakage than the 3% breakeven calculated using the incorrect ratio of 34 for the calculation, and only equal efficiency plants. Estimates of leakage have mostly been less than 8%, and it is said to only cost a penny out of the $4 per 1,000 cubic feet or 10 therms cost of natural gas to reduce leakage. The table below shows the savings in greenhouse gas CO2 equivalents for various values of leakage, and assuming that CO2 has an effective lifetime of 100 or 200 years. Here are some general facts about methane. Methane is 9% of US greenhouse gas emissions. Its lifetime in the atmosphere is twelve years, and it is destroyed by atmospheric OH. About 40% of methane comes from wetlands, including rice farming. About 20% comes from energy production. About 20% comes from livestock (cow burping). If averaged over a 100 years, it is 34 times more potent than CO2 by mass. CO2, however, may last longer than 100 years. You often see stated that if averaged over only 20 years, methane greenhouse effect is a factor of 86 larger than CO2, but this is not relevant since CO2 lasts at least a hundred years. What is important is to cut CO2 from coal, and to keep fugitive emissions of methane very low. This entry was posted in Climate Change, Coal, Electric Power, Energy Efficiency, Fossil Fuel Energy, Greenhouse Gas Emissions, Natural Gas. Bookmark the permalink.